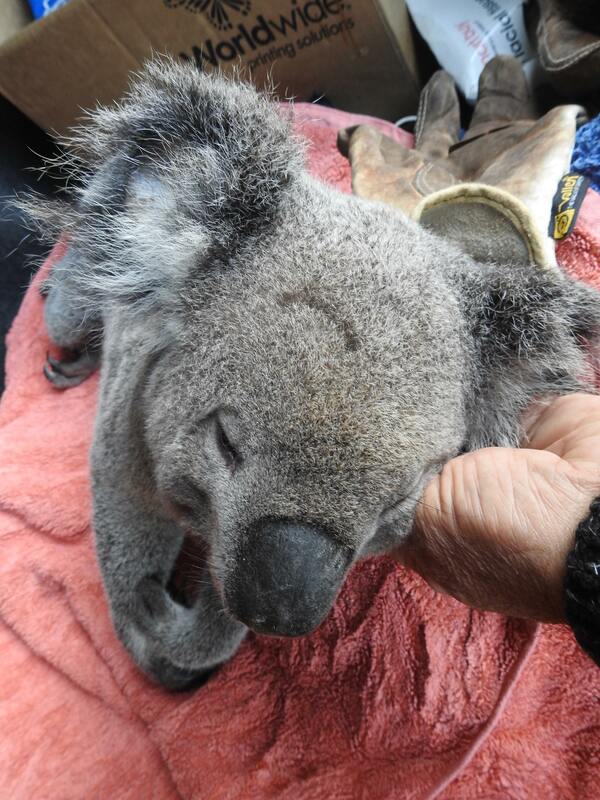 I had just collected a healthy young male Koala dead beside the Mains Road on-ramp to the Pacific Motorway. Fox Gully Bushcare neighbour Miranda had emailed to let me know she had seen a Koala beside to road as she drove to work. Matt’s frustration reflects the number of Koala that have been killed trying to cross the Motorway from Mt Gravatt Conservation Reserve. 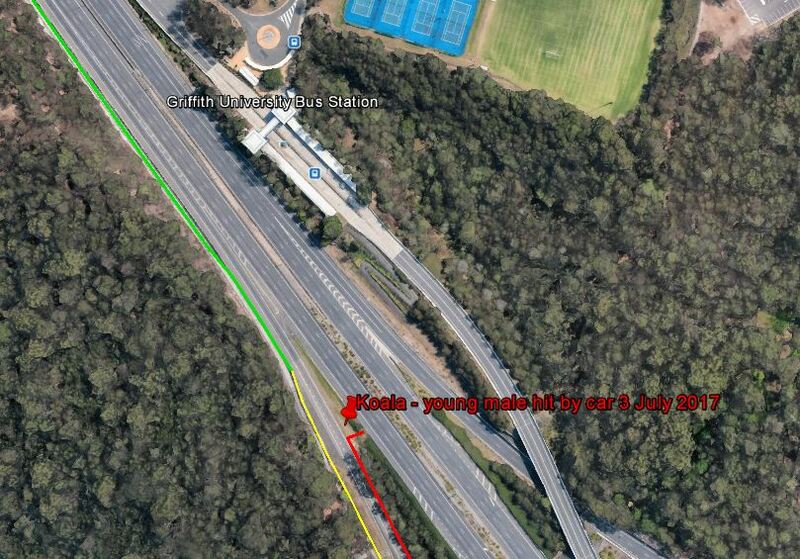 Limited wildlife fencing around the Griffith Bus Station and no fence at all on one side of the Mains Road on-ramp (red line) means nothing separates the traffic from the trees on which Koalas are feeding. At least three joey Koalas were born in Mt Gravatt Conservation Reserve in 2016 however I think we lost one of those joeys today. I have previously discussed the possibility of wildlife fencing with Griffith researcher, Cathryn Dexter: co-author of the 2013 Koala Retrofit Works Program report for Main Roads. Cathryn explained some of the many issues in designing and maintaining effective Koala fencing. Also considering we have had a Koala killed on Klumpp Road and a number of car strikes on Creek Road, effective Koala protection in our urban environment will require significant commitment to building wildlife crossings to connect fragmented bushland habitats. Back to Matt’s question about how to help with lobbying. Create and certify your own Pollinator Link® garden: Water, Food and Shelter for wildlife. One person or one family may not have a lot of influence, however, every individual Pollinator Link® garden registered contributes to achieving our goal of 30,000 Brisbane gardens by 2022. The support of 30,000 Brisbane households will give us the influence at local and state government levels to push for more wildlife fencing and road crossings. You can become a Pollinator Link® Hero by getting ten family, friends or neighbours to create Certified Pollinator Link® gardens and help bring a bit of Australian bush back to Brisbane backyard. Reblogged this on Pollinator Link. We rescued a koala and her joey who was walking down the gutter on Logan Road, Mt Gravatt on 14 March 2017 at 8:30am. All the traffic fortunately had slowed to watch her otherwise she could have very easily got scared and run into traffic. Great news story … thank you Deb!! Please send some photos so I can share.